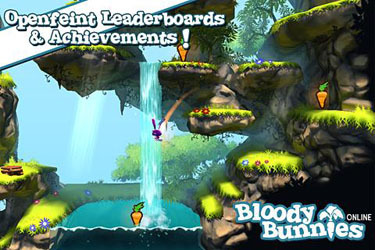 Bloody Bunnies: Jump around like crazy and drop on your opponents to smash them into a pulp. This is a visually stunning 3D rabbit killing game which will let you fight your mates in a test of your Super Mario jumping skill. On first impressions this is a fantastic game, but after trying out the different gametypes you might find this a bit hit or miss for yourself – nonetheless do support indie developers and try the game! Gameplay: Picture this… take Super Mario Bros… put in between 3 and 6 Mario players… then swap out the whole theme and shove cutesy rabbits in… oh and make everything 3D… That’s essentially what the core of Bloody Bunnies is about – it’s a 2D platform game where you mount opponents to squash them to smithereens so that you can win the stages. Ok… ok… it’s not quite as simple as that. There are three game mode types: ‘Carrot Hunt’, ‘Death Match’ and ’Survival’. In Carrot Hunt you need to collect all 5 carrots to win, but if you get squashed then you’ll lose your carrots and need to start again. Death Match is self explanatory – get as many kills as possible whilst not giving up too many lives. In Survival you’re faced with a series of rounds where there are AI bunnies which become more menacing as you progress. There is a final ‘Custom’ mode where you can customise the settings of the three other game modes. Bunny Power: There’s some great stuff in this game: stunning graphics… truly amazing environments… the maps include beautiful seasonal landscapes which are embellished with waterfall cliffs. Unfortunately the music is not on the same grand level. It’s slightly irritating and gets particularly annoying when you play for a period of time (like in Survival mode). So in short, the art style is good, but thinking about the overall package – the music lets the game down. To be honest, we couldn’t quite get our head around the theming. You’ve got cutesy rabbit theming in a beautiful serene setting… and yet you’re pasting the place with the remains of your kills… nah.. this wasn’t quite for us – but if you like that kind of thing, then this is perfect. Some cutting edge components: the on screen d-pad is exceptionally good – it even worked on our HTC Desire which usually encounters multi-touch problems! If you’ve got a new generation of phone then you can take advantage of the adaptive D-pad which will readjust the pointers to account for changes in your thumb position. We tested the Beta version of the game which wasn’t fully complete. So we encountered a lag every time awards and achievements were posted onto OpenFeint. There was also a slight pause when we killed an opponent which was quite distracting. We were only able to play single player games against the AI because there weren’t any other people playing when we were testing. But, we think that if you get your mates together to play then you should have quite a laugh. Bloody Bunnies is out now, so you may be wondering why we’re referring to the Beta version, and we didn’t just go out and get the game to verify if there are any problems… well… its because we can’t download it onto any of our test devices. Our phones just simply tell us that there is insufficient space to install the game. Technically, we think if we removed everything on the test devices then this might fit… but hey that’s a totally unrealistic test to be honest. So unless you have one of the new generation of phones, then you won’t be able to download this game! When the apk does reach those apk websites/storage servers out there though, it’s worth downloading because they shrink their 37 MB into an awesome 800 odd Kb of active memory – now that’s a feat! Verdict: 3/5 Bloody Bunnies is a good game if you can get hold of the apk and then you get your mates together to have a fight out. I’m pretty sure you’ll have a laugh for a decent while. But as a single player game… unfortunately we were thinking that this might be a tad dry unless they get a critical mass of users playing. On the grander scale we were tempted to give this 2 stars because the beta version had a fair number of issues which detracted from the fun – in fact it bricked our device such that we needed to take the battery out to reset the device… But hey, that was the Beta, so we’re fairly sure that wouldn’t happen on the latest version. A beautiful and stunning game which clearly has a great 3D developer on the team… but just like in the cinemas: making something 3D doesn’t automatically make it better. Hop on the water, because swimming is really dangerous and very slow. Teleports can work for you AND against you. Be careful of teleporting into enclosed spaces. If you watch your opponents carefully you can probably spot the ones who have problems with the control interface because they’ll jump vertically trying to time their attack. The game is more fun with many players, so keep a track of how many people play on the different days and times. Try to play when it’s semi-peak time so that you get real players instead of AI. 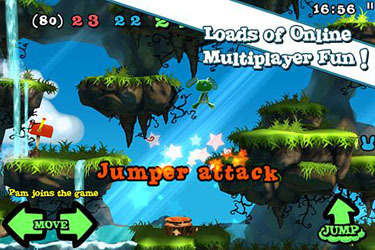 The levels are designed in a rather weird way whereby there are many areas where it’s difficult to jump. If you have lag then try and stay away from these as the chances are that you’ll be stomped before getting your opponent.